On Monday 5th November 2018 Prof. Dr. theol. 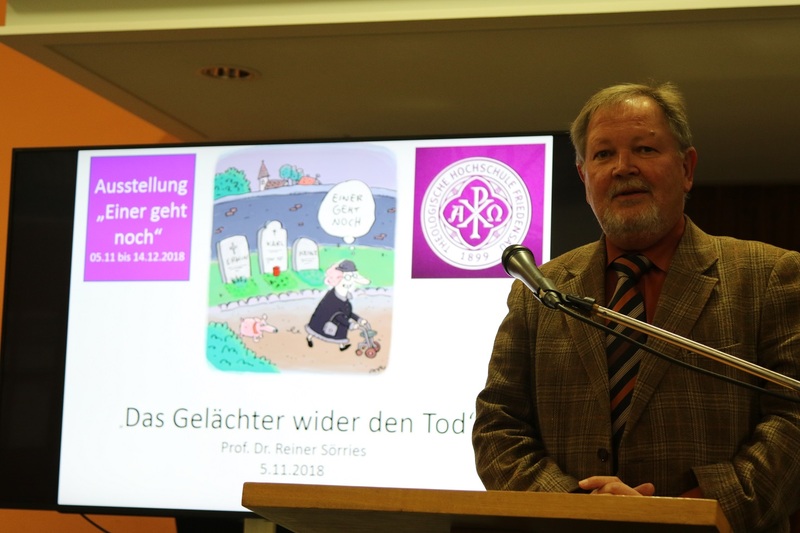 Reiner Sörries gave a speech in the library of Friedensau Adventist University, concerning “Laughter against death”. This event was part of the series of events “One University -One Book”. The secular meritocracy tries to give answers on how to live your life, but it refuses to answer questions about death or negates it. Although religions show perspectives about the finite life, they are unstoppable in the retreat of industrial societies. But what do they have to say to the “Empirical Nothing” after death? Are heaven and hell more attractive than rebirth and soul wandering? Or is there any evidence about an afterlife in modern society? Does it succeed to eliminate death? But until our time has come, we can simply have a laugh against death, which isn’t that unchristian as it may seem. Following the seepch was the opening of the exhibition “One for the Road” – cartoons and caricatures for life and death at the library of Friedensau Adventist University.